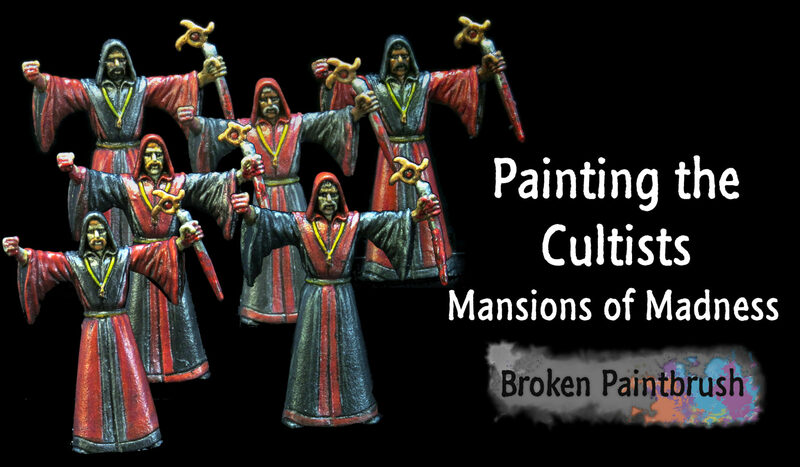 Ready for another Mansions of Madness painting tutorial? 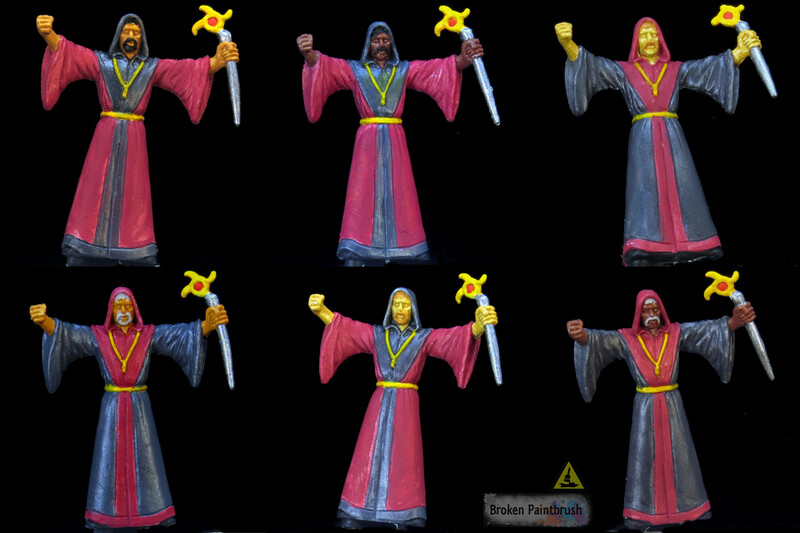 This week I have the Cultists adorned in their fancy robes. While these guys are nearly worthless by themselves in the game, they have a habit of sacrificing each other to turn into monsters – which is awesome! When I started painting the cultists, I decided to mix them up a bit. While this messes with the game’s concept of each character having slightly different abilities, it does make them more interesting to look at. 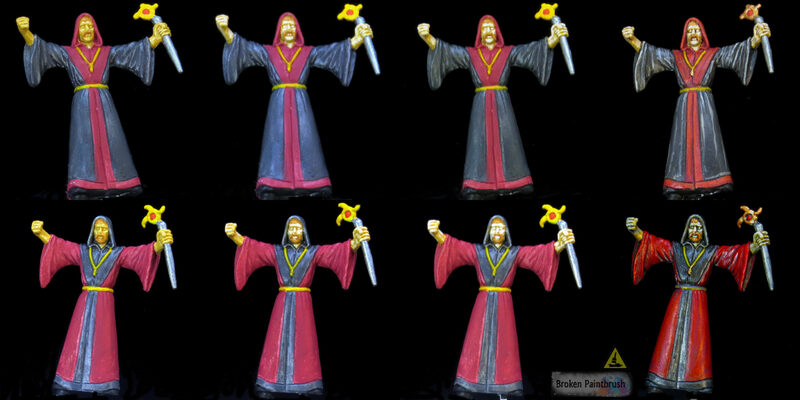 So I split the six cultists models and painted half of the robes black with red trim and half red with black. They were then also divided into three different skin tones: light, ‘yellow’ and dark. I started with painting all the base colors to block in each area. You might notice I wasn’t too concerned about getting a perfect coverage on the robes as I will later add additional layers and washes. This is an excellent example of how to speed up some of your painting. Since I am going for more table top quality than a competition, I knew I could skimp a bit on the layers. The three different skin tones were painted first because they were the lowest level of the model. I layered up each color before applying the Dark Brown wash over the whole model. The dark skin was kept relatively simple with three layers of brown: Mahogany (base coat), Parasite, and Light Brown for the extreme highlights. The Dark Brown Wash helped bring it all back together and darken the skin. The yellow skin tones fall somewhere between the dark and light faces but add a bit more yellow to the shade. Light Brown was used as the base with Medium Fleshtone used as the highlight. This is where the yellow tone gets added in. Basic Skintone was used as the extreme highlight. Finally, the Dark Brown Wash was applied lightly over the skin to shade the recesses. For the light skin, I wanted to make them very pale. So while the first two layers match the top layers of the yellow skin, the addition of the pure white highlight make the skin very light. I had to be extra careful with the Dark Brown wash on this guy as the light skin colors wanted to take the brown. On a few areas, I needed to re-highlight with the Basic Skintone. Next up, I painted the red and black robes. While I painted the layers before the wash, I figured you wouldn’t mind a bit of jumping around. While I wanted the robes to be dark, I was also going for some extreme highlighting in the pre-shade phase. So the clothes went from Model Color Red (a dark red shade) to Hot Orange. 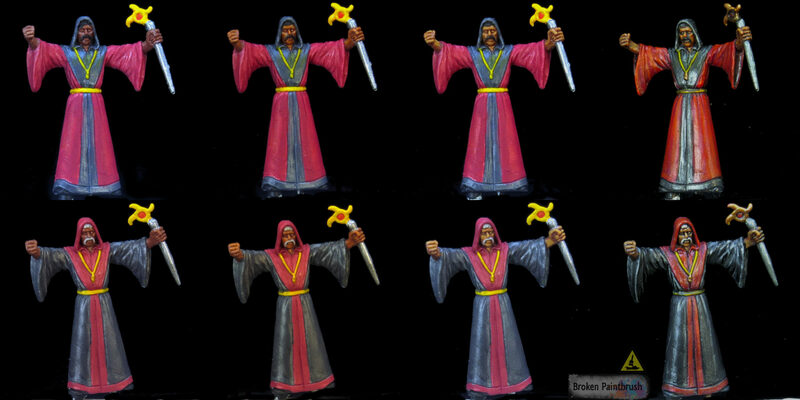 The Dark Brown Wash helped tone it back down and create the nice, rich robes I was hoping for. 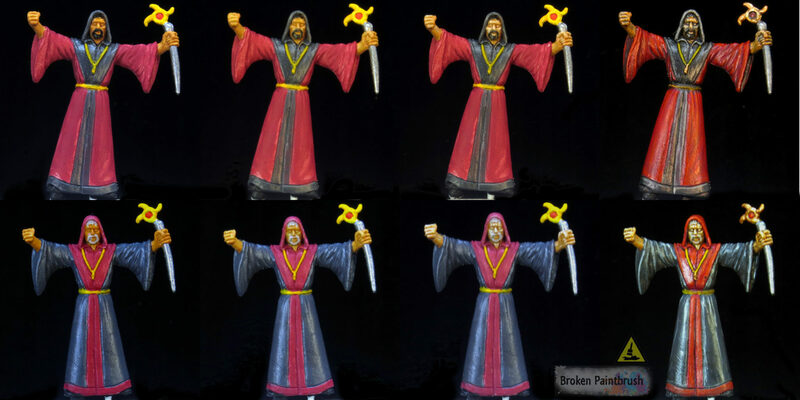 With the black robes, I went with a higher contrast for the pre-highlights. 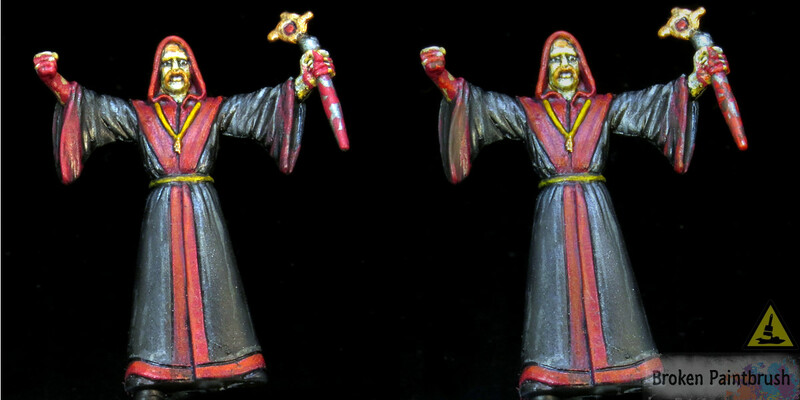 This gets toned back by the extra layer of black wash on the robes. I relied on the extreme highlight and two layers of wash to get the look rather than multiple layers. By using Stonewall Grey as the highlight, it made for an almost awful looking model (middle picture above). 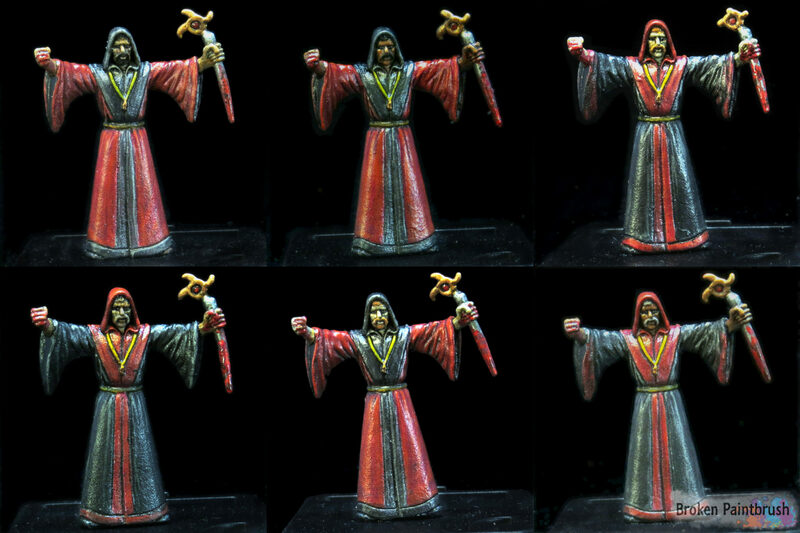 After the whole-model Dark Brown Wash, it wasn’t toned down enough, so I hit all the black robes with a second layer of Black Wash which got it to where I wanted it. Now to give them a bit of gore to make them scary. I gave each a dash of blood to the blade and clenched fist as if they had just ripped the latest sacrifice’s heart. Or something epic like that as long as it summons a shoggoth. The big trick to getting blood effects is two things: use different shades of red and use it sparingly. While on the Maniacs I went a bit overboard with the gore effects, I kept it limited on the Cultists to the blade and fist. Even then, I didn’t cover them, but rather added splotches of paint that still left areas of the original exposed. The clear gloss adds that extra special touch at the end that makes the blood still look wet (see the showcase pictures at the bottom). With these guys done, I’m nearing the end – especially regarding model count. Let me know you think and if this tutorial was helpful in getting your own models completed.